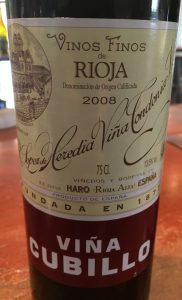 2008 Bodega R. Lopez de Heredia, Rioja Crianza, Vina Cubillo, Rioja Alta, Spain. The beautifully rustic old world Rioja Vina Cubillo Crianza 2008 from Lopez de Heredia is crafted from estate grown grapes featuring about 65% Tempranillo, 25% Garnacho, the local named for Grenache/Garnacha and with small amounts of each of Mazuelo and Graciano that is aged in large casks for 3 years with multiple racking(s) per year and getting a light fining for purity and clarity, while being bottled unfiltered to preserve all the natural character. The 2008 is open and textured, easy to love, highlighting the terroir of Rioja Alta and especially that of Vina Cubillas, which has an altitude of 410 meters, that keeps cool at night to ensure good acidity, and the vines have an average age of 40 years, that adds to the concentration and maturity of expression. The soil here is from the Tertiary Period (a geologic period from 65 million to 2.58 million years ago) and is a mixture of clay and limestone with a littering of river stones that gives these wines their Burgundy like quality and class, it’s place for exceptional Tempranillo, as well as Graciano and the Garnacha and allows the lighter and more delicate nature show through, and even though Vina Tondonia is their flagship vineyard, I always love the Vina Bosconia and especially this Vina Cubillo with it’s softer and more raw personality. This wine shows a slight oxidative note, and an earthy truffle/leather tone at first but feels lovely on the palate, and the stewed fruit blows off and gets fresher with air allowing a hint of dark flowers, creamy cherry and the palate deepens with an elegant textural sense adding a bit of wood and tobacco leaf as you sip further. The layers of Tempranillo led flavors unfold as expected with dark berry, anise and vanilla making core appearances, it needs food to really shine, rich winter stews, country or old school meat dishes and wild mushrooms do wonders for this classic Rioja, drink now.